Of all the things to leave for Santa, when he's tired of Nutter Butters here comes a little present for him. 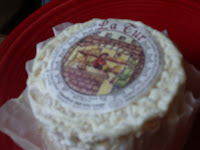 La Tur always makes a splash on my cheese plate. While being soft and occasionally nice and runny, it won't smell up the car on the ride home. Made in Northern Italy of the milk trinity - cow, sheep and goat that is, there's something for everyone to like. The fresh center has that goaty crumble, the rind has a fresh bloom but is less chewy and pungent than heavy brie, all with the tangy smile of pecorino flavor throughout. When perfectly ripe la Tur has a beautiful halo of ooze (a technical term) just flavorful enough to keep it intriguing without reaching for the sock spray. The edible rind is bloomy and wrinkly like a hairless pug and not at all imposing in the mouth. The label on top is made of rice paper and is edible, but I prefer to put it on the side of the plate as food art. The scene it contains of a woman selling cheese and bread from a small stand makes me think I'm back in Bologna, in the little alley that has the food shops normally kept away from tourists. Janet Fletcher writes about cheese weekly in the San Francisco Gate. See what she thinks of La Tur. Most cheese is best eaten with fresh crusty bread. La Tur is memorable alongside Pecorino Ginepro and Gorgonzola Dolce, also from the same region. Add some Prosciutto di Parma, dried fruits and nuts, maybe some crostini and a glass of wine and you have a meal. I tried to find that classic commercial on YouTube, but no luck. I'm impressed you know the famous, or sometimes not so famous, line. We can continue this. You educate us on food, we give you guidance on gadgets. The ad campaign was recycled last year with a new kid. I left cheese not for Santa but for Santa mouse, who also rides in the sleigh. There's a great book about him.